In the 20th Century we witnessed, on the one hand, two World Wars, totalitarianism, the Holocaust and Hiroshima, and on the other hand unprecedented scientific and technological progress from the conquest of air and space through to the information society. Never before has Mankind had to suffer to such an extent the trials and tribulations of History, whilst at the same time sharing in a fantastic revolution in the arts and way of life. 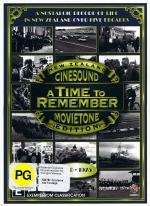 This exceptional DVD collection features pristine archive Pathe newsreel footage from the great international events that marked both our history and everyday life in a collection of first-hand, eye-witness reports.